Mozart Eine Kleine Nachtmusik K.525, all mvts., for string quartet, CM018 composed by Wolfgang Amadeus Mozart (1756-1791). Arranged by FCMUSIC. For Violin, Viola, Cello, String Quartet. Classical Period. Intermediate. Set of Parts, Score. FCMUSIC #CM018. 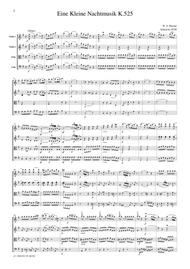 Published by FCMUSIC (S0.13222).Mozart Eine Kleine Nachtmusik K.525, all mvts., for string quartet, CM018 Sheet music for string quartet published by FC MUSIC. Set of score and parts(Vn1,Vn2,Va,Vc). About publisher: FC MUSIC is a sheet music publisher in Japan. Arranged sheet music for chamber music as String Quartet, String Quintet, Piano Trio, Piano Quintet, Violin Ensemble have been published since 1997. Now on sale at the famous music store as YAMAHA in Japan.About Digital Print Sheet MusicDigital Print is printable sheet music available anytime, anywhere. Just purchase, print and play! View your online sheet music at home, school, work or anywhere you have a computer connected to the Internet. Use our iPad app to view your digital sheet music on the go. With Digital Print, you can print your digital sheet music immediately after purchase, or wait until its convenient. And our software installation is easy - we'll guide you through the simple steps to make sure you have Adobe Flash Player, Adobe AIR and the Sheet Music Plus AIR application.